24.12.2009 - We wish all Merry Christmas! 06.12.2009 - I love the dogshows so much, so we went there to have a look on the champions. 05.12.2009 - I await the certificate for kennel every day now. It would be a great christmas gift. 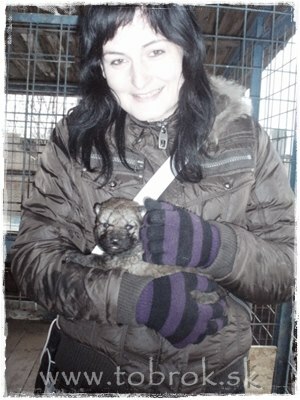 Also we reservated a female in one kennel, so I hope we will have her soon by us. 28.11.2009 - We wish happy birthday to all G Malý Bysterec!!! Grace, Glen, Gigx a Gunner!!! 26.09.2009 - Gunner Malý Bysterec participated SVP 1! The endurance run for 40km. The result is "very good" and we have now another term of stud done. 29.08.2009 - Our pages have now an icon, so you can easy add them to favourites and find it by this easy. 30.07.2009 - In gallery are now also our videos, posted on You tube. 22.07.2009 - The first day of our pages online. Wellcome!!! 06.06.2009 - We were on the Grandprix Nitra with Gunner to have a look on the champions. 25.04.2009 - Gunner is getting up slowly from the narcose, took it very bad, but I hope, he will be good soon. At evening, he was OK to get outside to a short walk and got some wather. Its getting to normal again. 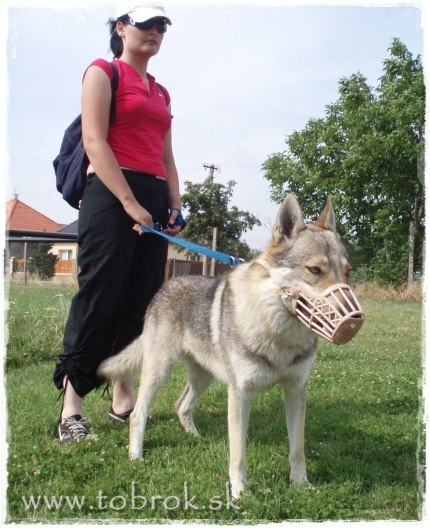 24.04.2009 - We were by our vet MVDr. Zubrický and have done the HD and ED Xrays. It seems at the first look excellent for us. No dysplasy. Also we have chipped Gunner and have got the EU pass. After narcose, he was very bad, only slept, had no power to go by himself. Now is sleeping by my bed, hope he will get up soon. 29.03.2009 - We were today on our second show XIII. 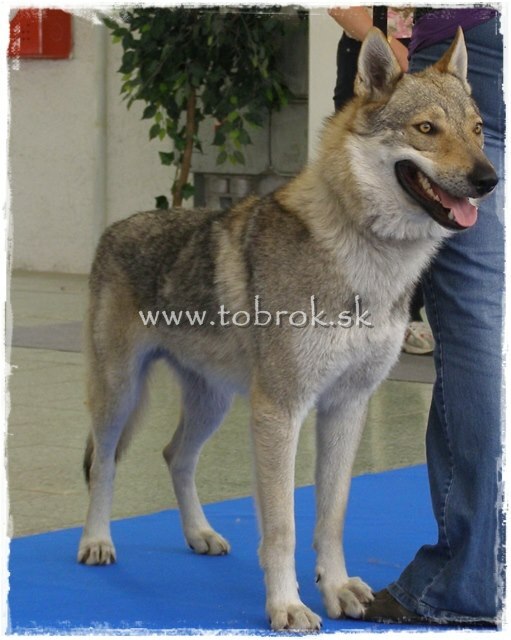 Europenian dogshow of Czechoslovakian wolfdogs, judge for males: Daiva Rimaityté, judged our Gunner with Very good. Besides us were in the class another 10 males and also Glen, Gunners brother. So with this we have done another term for stud, two dogshows, recommendet by club. Gunner does not like the shows at all, so we end the shows. 28.03.2009 - We participated on another show with Gunner - Nitracanis -CAC, judge: Gabriela Ridarčíková. 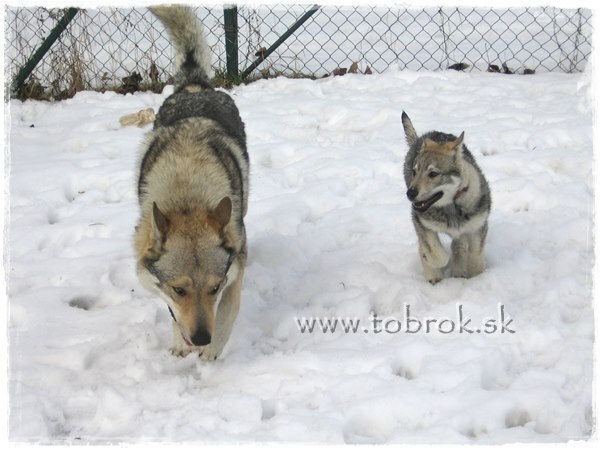 14.03.2009 - We were on another meeting of Friends of Czechoslovakian wolfdog in Nitra, there were our old friends, but a lot of new ones did come too!!! 07.03.2009 - In Nitra was a micro meeting of CsW and we were there too. There was Ainu Tasha, who is living in Nitra. 10.02.2009 - I was in kennel Tasha to visit the puppies. There were two puppies born Ainu and Arien. Sire Amor Gabčov dvor and dam Grace Malý Bysterec. I woul realy like to take Arien to us, but I cant. Ainu will live in Nitra, by our friend. 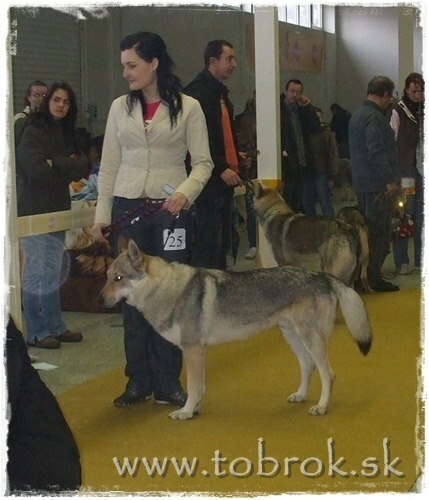 02.11.2008 - We were on the club show of CsW in Nitra, judge: OSkár Dóra, but did not participated. 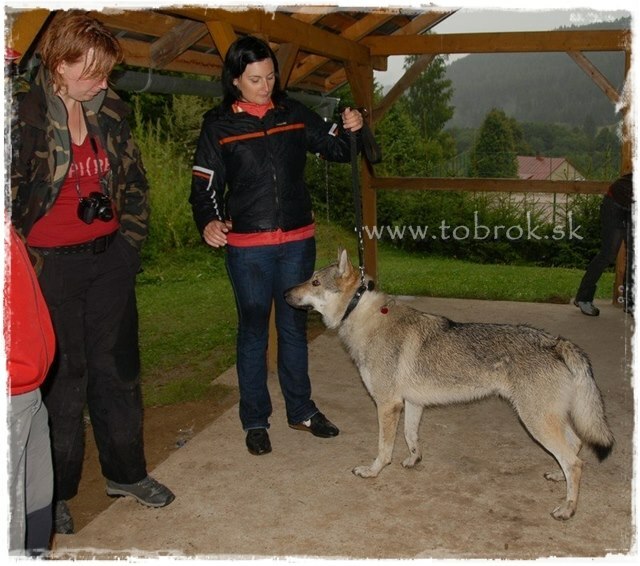 18.10.2008 - We have organised the first meeting of friends of Czechoslovakian wolfdogs in Nitra! On plan was a trip to Zobor and than a small dinner in centre of Nitra. 26.08.2008 - We met a small trip to mountain abouve Nitra, called Zobor with my brother and his son. 09.08.2008 - Our Nero absolved another term of stud - youth presentation with result - very promissing! I was in stress, the whole day a hard rain, but we manage it! The judge Soňa Bognárová gived him a judgement: Male in age of 18 months, full dentition, bite scissors, both testicles, bright head, light eye color, bit loose corners of mouth, short ear, good shape, tail of recomendet lenght, light movement. 03.-10.08.2008 - We were on our first summer camp in Hronec. It was amazing! I met so many people. And also, i did learn many about the breed. The people we met her will be our friends for future. We plan more actions together. 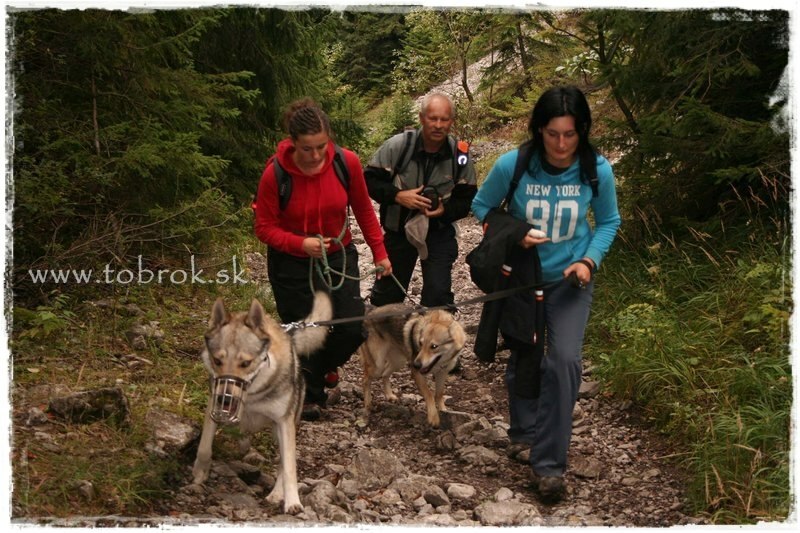 13.07.2008 - Today we had in Galanta meeting of "G" litter Malý Bysterec - There was Grace, Glen and we. It was a great day, but Glen and Gunner had a problem with themselves. 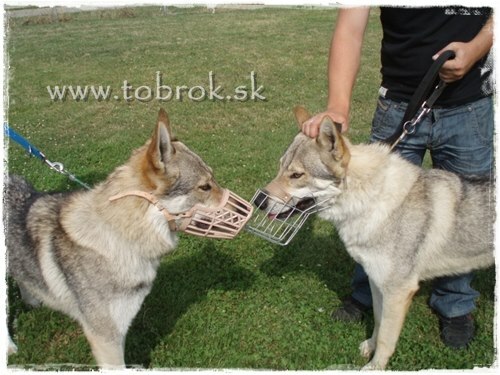 After separation, they did not liked themselves and must have muzzles. But Im happy, tha we are friends with the owners of Glen and Grace. 07.06.2008 - Our first dog show! For me and for Gunner too. GrandPrix Slovakia, Nitra. Judge: Ridarčíková Gabriela (SVK). Our Gunner got Very good 3 out of 3 dogs. We are happy, was our first time :) I felt great in the ring, althought Im bit sad about the result. But it seem, the shows will be my favourite. Gunner was about it not so realy happy. 05.04.2008 - My first csw action, thank to Ondrej Vavro, I have got the chance to wisit the endurance run. On this exam, i get know Frederika, owner of Grace Malý Bysterec and also many other great people! 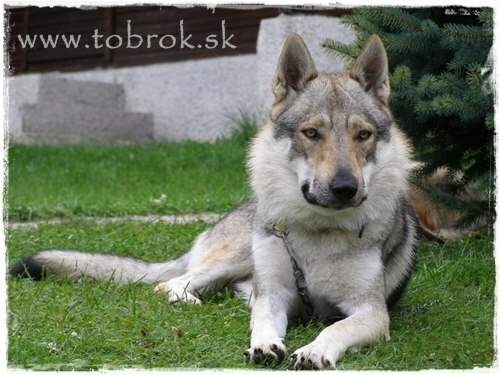 My wish to have a "wolf" is now bigger! 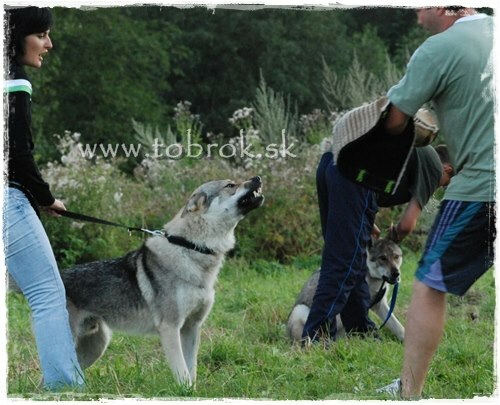 The run for 40km is interesting exam of the endurance of wolfdogs. Im curious, if I can manage it one day :) Besides the terrible cold, was a great action. Galery on wolfdog.